The 18th annual GBBC will be held Friday, February 13, through Monday, February 16, 2015. 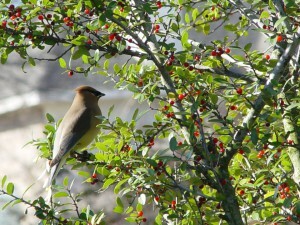 Participants may also send in photographs of the birds they see for the GBBC photo contest. A selection of images is posted in the online photo gallery. • How will the weather influence bird populations? • Where are winter finches and other “irruptive” species that appear in large numbers during some years but not others? • How will the timing of birds’ migrations compare with past years? • How are bird diseases, such as West Nile virus, affecting birds in different regions? • What kinds of differences in bird diversity are apparent in cities versus suburban, rural, and natural areas? This entry was posted on Tuesday, December 9th, 2014 at 9:10 am	and is filed under News & Updates. You can follow any responses to this entry through the RSS 2.0 feed. Both comments and pings are currently closed.